@sammyc521 and @Veda-the-Moor attend day 3 of Training Camp. The line for day 3 was incredible short. An hour before camp starts and there's plenty of space. Coming off a non-playoff year it's not a huge shock to see interest down. Big drop from last year. 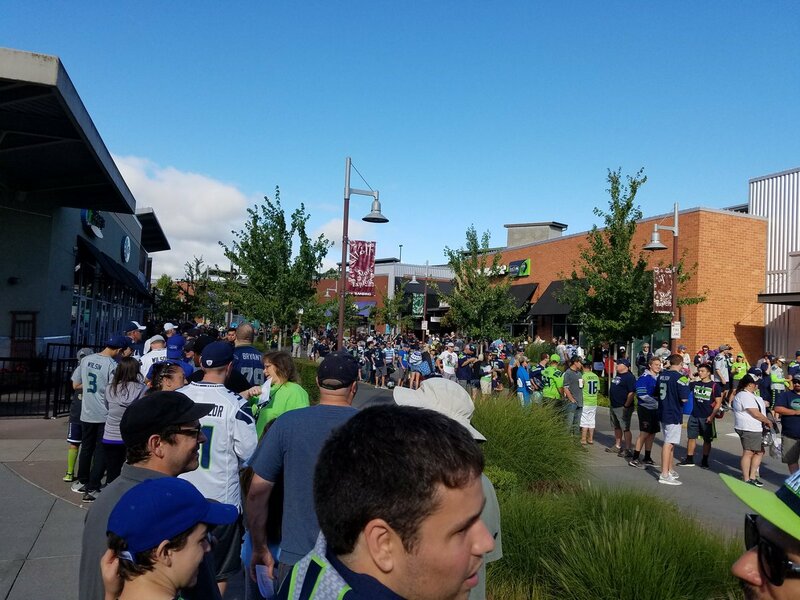 Normally, the 1st training camp day is always a weekend and that means there's bigger crowds because people usually have the weekends off. But I arrived around 8:10 in the morning that the lines were only like 40 people deep. 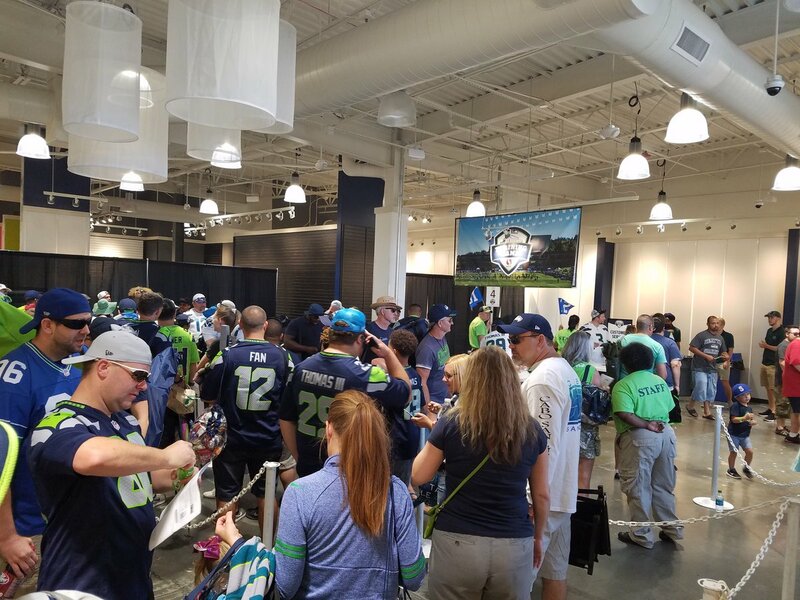 @Veda-the-Moor already alluded to the fact that many casual fans may be bowing out due to the fact the Seahawks did not make the playoff last year. @pehawk tweets that he could beat up anyone on this bus. There's nobody on that bus I could take in a fight. Not one. 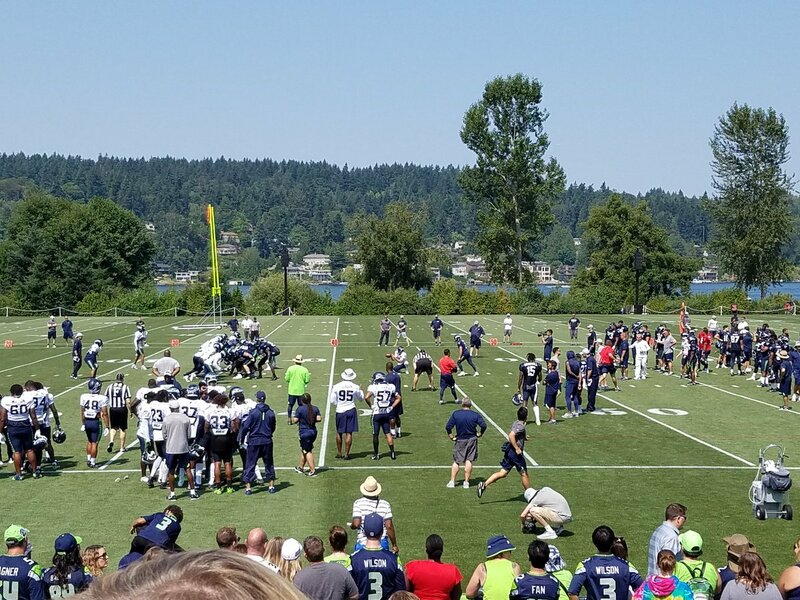 Surprisingly, there's no random "Go Hawks" cheers or the very impromptu bro chants of "Sea" "Hawks" at this camp during any line. 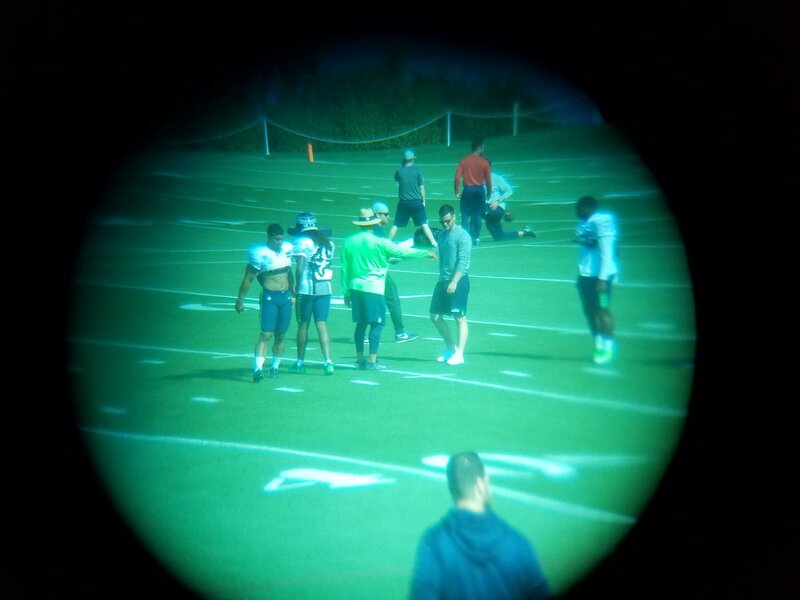 As always, Jon Ryan is the first Seahawk on the field. He's later joined by K Jason Myers, P Michael Dickson and LS Tyler Ott. P Sebastian Janikowski doesn't make an appearance until camp officially opens. Ken Norton Jr and the LBs are the next players on the field. LB Shaqueem Griffin gets cheers from the crowd as they start warming up before the rest of the team comes. QB Alex McGough looked very comfortable taking snaps with the 2nd team. He had a nice drive that fizzled out and resulted in a FG. He doesn't look lost on Day 3 and seemed to move within the pocket well. He had one throw that would have gone for the TD but he misjudged the speed to the TE and it went wide right, but it had enough zip that it wasn't a risk of getting intercepted. He found RB Rashaad Penny multiple times on this drive (something we rarely saw in a Bevell offense; RB as an outlet) and gained positive yardage. McGough's family also loved the message about their son. RB Rashaad Penny caught every pass thrown his way. He almost caught a TD in the corner but the ball should have probably been thrown a half-second earlier. In college it would have been a TD. Was impressed when CB Justin Coleman came in for a Nickel Blitz and Penny squared him up and blocked the play well. In the few rush drills, it was pretty bad but Penny did have the run of the day. LB Shaqueem Griffin is already a fan favorite and a house-hold name among all Seahawk fans. People were already buying his jersey and looking for him among the crowded field. I first noticed when he was in Punt coverage; he was assigned the most-left blocking position and was able to mark two down-field going for the punter and then was able to turn up-field to cover. He got reps with the second defense at SLB. He played a good mix of zone and man in coverage drills and was able to follow RBs and TEs he was assigned. One of his best plays was when it was a throw in the flats to an RB and he tackled (or engaged) extremely well. In pass rush he was easily swallowed up by larger Guards; he basically hit a wall. In the few run def he took good angles and was able to attack the RB at the LOS. P Michael Dickson was hard to gauge due to not knowing what kind of Punts the Seahawks are expecting out of their Punters. When compared on simultaneous punts, Ryan would boot them further, and with more hang-time. TE Wil Dissly looked great. Got second team reps and seemed to catch everything thrown his way. He and TE Nick Vannett will be strongly competing for the 2nd TE position after Ed Dickson returns. Both Kickers were able to successfully convert all their FGs for the day. They finished off by kicking 53-yard FGs with leg to spare. A huge departure from Blair Walsh who only attempted one 50-yard FG all year long... and he missed it. QB Russell Wilson is still the first one running across the field in team warm-ups. He's the QB version of Pete. He throws a beautiful ball that just has great placement. It's good to see his arm vs. QB McGough and QB Austin Davis. Wilson is also one of the first to congratulate players on a TD drive. The RBs are all very jacked; they're all playing with high energy. 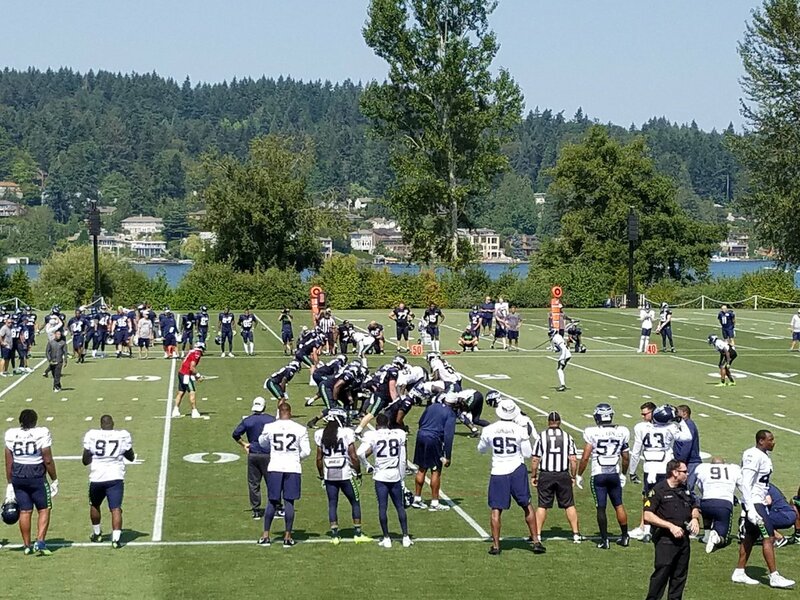 RB Chris Carson is getting 1st team reps with Penny right behind him. 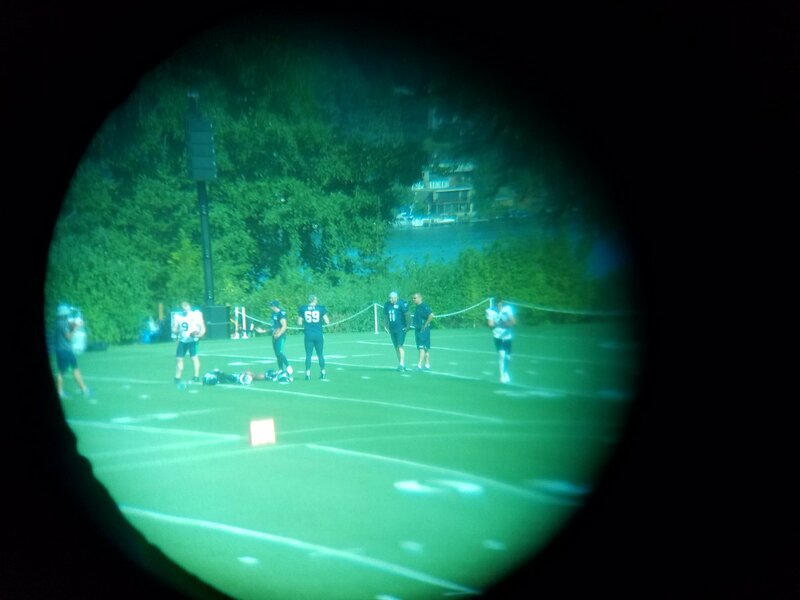 Davis, McKissic and Prosise were getting much smaller reps.
WR Doug Baldwin and DE Dion Jordan were in jerseys but no shells/helmets; purely observing the field. No player coaches - In previous years, Earl, Kam, Sherman and Bennett would always been seen running up to younger players after a play to hype them up. Many times they were additional coaches on the field but there's not that kind of action on the field now. This might be for the better as it enforces the coaches role but it's something I miss seeing.